A well stocked pantry is valuable for many reasons, right? Trouble is, lots of people don’t know where to start when they decide to build their own pantry stockpile. It can be expensive and confusing. But, it doesn’t have to be. Let me show you how to build your pantry stockpile. Plus, why you need to have a pantry that’s full of everything you need to survive any emergency. As insurance against roller-coaster prices, financial trouble and external adversity like extreme weather events, just to name a few. When your pantry is full, you’re prepared for any kind of modern day siege; cut off from civilisation by flood waters, snowed in or the financial wolf is howling at your door. Food security was paramount in the thoughts of most communities until relatively recent history. ‘Just in time’ logistics systems apply not just to the movement of stock to stores but also of produce to plate. How many times have you gone to the supermarket to buy food for just one meal? Dropping into the shops on the way home from work to pick up what you need for dinner is ‘just in time’ logistics. Note: This post, How to Build a Well Stocked Pantry contains affiliate links. Remember to save ‘How to Build a Well Stocked Pantry’ to Pinterest and share with your friends. 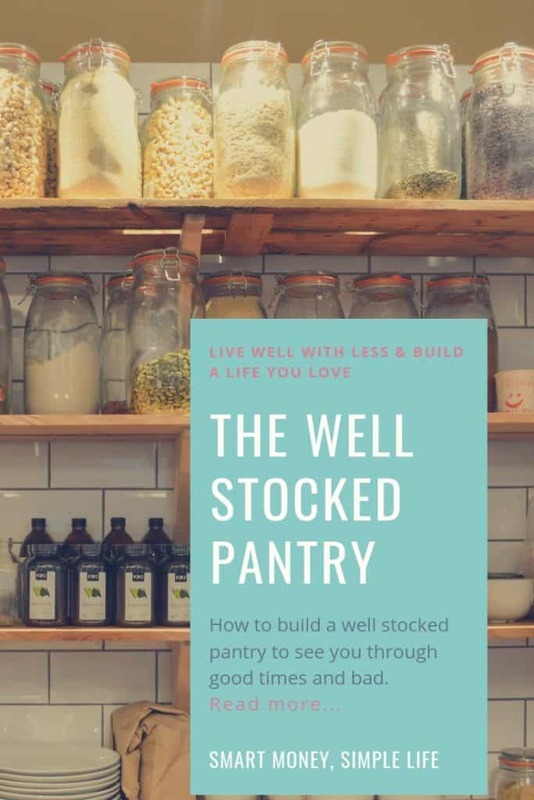 A well stocked pantry or stockpile is central to a smart money, simple life philosophy. It enables you to shop less frequently, buy in bulk and take advantage of specials at the supermarket. You’ve probably heard this before, but to put its value in context, you just need to have read, watched or listened to the reports of panic buying during any emergency, whether caused by an act of nature or the result of industrial action, to see the value of a well stocked pantry or stockpile. Supermarket shelves emptied in hours, price gouging, violence… In most cases these localities would have been without fresh supplies for only a few days, a week at most. You can avoid scenes like this if your pantry or garage or spare room contains the basic supplies for at least a month, but preferably three. Avoid impacts to ‘just in time’ logistics with a well stocked pantry. Building your well stocked pantry doesn’t mean three dozen tins of baked beans stacked up in neat rows, unless of course, you love baked beans. It means building a back up supply of the ingredients you use every day. If you cook from scratch, you understand intimately which ingredients you need a decent supply of. If you rely on pre-packaged foods it might be a bit more of a challenge – they will take up more space and cost a lot more. Presto Pressure Canner: A pressure canner enables you to can your own ‘low-acid’ foods – like soups and stews – to add to your well stocked pantry. It has ample supplies of flour, other baking requirements like yeast, the raw ingredients for baking powder plus salt, sugar, rolled oats, milk powder and cocoa. Protein ingredients are dried legumes and tinned tuna, plus there’s also tinned tomatoes and tinned fruit in the cupboard. And, complete meals will be added to the shelves as I get the hang of using my Presto Pressure Canner. I also have a stock of basic consumables on hand too; toilet paper, soap, toothpaste, etc. Plus, I keep a supply of fresh milk, meat, butter and lard in the freezer. Oh, and cat food, lots of cat food – I always stock up when it is on a super special, which generally happens every few months. And, that’s a good reminder to make sure you include the four legged, feathered, scaled, etc., members of your family when you’re building your supplies. These are just some examples of what I keep a stock of in my cupboards, your needs will probably be different. A well stocked pantry gives you choices not available to those who operate on ‘just in time’ logistics. It saves you money if you buy only those ingredients you use, and you buy them in bulk and/or on special. It gives you a buffer against financial adversity because even if you’re without an income for a few weeks, you still have food in the cupboard. And, the future always looks brighter on a full stomach! Insurance you know will pay out if times get tough. No well stocked pantry is complete without a good supply of herbs and spices. Investing in a well stocked pantry requires planning. You need to know where you are in order to map out the route to your destination. Organising your stockpile is no different. What’s in your pantry now? Is it past its expiry date or best before? How many of each item do you have? Will you (and your family) still eat it? If not, can you donate it? You might be surprised at just how much stuff has made its way into your pantry, never to see the light of day again. Sort through it as quickly as you can, if you linger too long at this task you’ll start to focus on the money that’s potentially been wasted rather than the task at hand (sorting it) and that’s not useful at this point. It would be prudent to throw away some things and I’m sure you know which ones when you see them. The ‘keep’ pile will form the basis of your stockpile, the ‘use immediately’ pile will mostly consist of items you bought on impulse rather than items you buy regularly so find ways to use them immediately. If you can’t, donate them via a local food charity. Anything you can’t ever see yourself or your family eating again, that’s still well within its “use by” or “best before” date, donate. Give your pantry a clean while it’s empty. You might want to cover the shelves while you’re at it, too. But, don’t get too carried away or you’ll lose sight of your objective, which is to start building your stockpile. When it comes time to refill your pantry, take a couple of lessons from the supermarkets. Make sure the items you use every day are the most easily accessible and that usually means eye level. Items that are heavy or bulky should be on the lowest shelf or floor, items that are used less often can go on higher shelves, which is probably a good place for the biscuits, too! And, employ stock rotation. 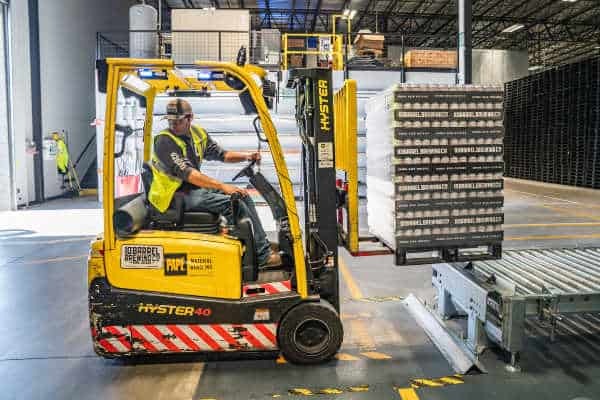 Make sure the oldest stock is at the front so that it will be used next and when you replenish your supplies, move everything forward and put the new stock at the back. 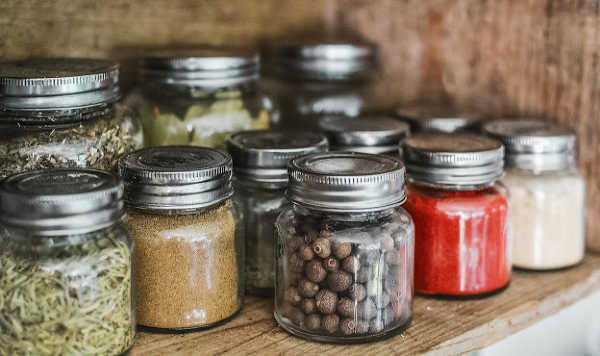 If you decant flour or other dry goods into jars, make sure you attach a label that clearly identifies the contents, when it was put in the jar and the use-by or best before date on the original packaging. A pantry full of mystery jars isn’t helpful. Same goes for mystery tins and cans. You can write directly on the lid or bottom of a can as a back up in case anything ever happens to the paper label. You don’t need to get fancy with your labels, although you can if you want. A sharpie and some masking tape will do the trick or you can grab a DYMO Label Maker and create crisp, clean uniform labels for everything in your pantry. Check the dates on the items you buy. Make sure it’s worth buying for your stockpile. Always rotate your stock. Always. When you’re adding new stock to your pantry make sure the products with the longest expiry date go to the back. Keep a stocktake list, including use-by dates. This can be as simple as a dry erase board on the back of the pantry door or as complicated as a spreadsheet on your computer. Do whichever works best for you. Work out how much you’re likely to eat in a year and don’t exceed that amount in your stockpile. Keeping most items beyond a year usually requires special packaging (like mylar bags) to keep it tightly sealed and fresh. A well stocked pantry provides choices not available to those who shop using ‘just in time’ logistics. It can save you money if you buy only those ingredients you use, and you buy them either in bulk, using coupon deals or on special. Remember, you’re Stockpiling Not Hoarding, so always think about what you’re adding to your pantry stockpile and if it’s really a bargain. Have you built or started building a pantry stockpile? What did you learn in the process and how has it benefited you? I have started a stock pile in my pantry because I have not been able to put food on the table because of lack of money. So now I keep the pantry as stocked as possible so I don’t feel like I can’t put food on the table. I do agree that some non perishables are needed in the pantry, but I would recommend keeping inventory to a minimum. Instead of buying in bulk, we get the same low prices by shopping at Aldi, which offers low price points at much lower volumes. Given how modern supply chains are these days, we won’t be without food for even a day in an emergency. Perishables, on the other hand, are tricky. For those, we attempt to eat leftovers right away, and lately I have been attempting to eat fruit that’s going to go bad first, before any other fruit. Sorry but you’re wrong. If there’s an emergency the stores won’t get stuff. Look at all the hurricanes, fires, earthquakes, etc. Some people didn’t get food or water for weeks. That’s the whole basis for a stockpile. My mom, grandma, & great grandma all did stockpiles & so do I. We’ve lived as a group through wars (rationing), the great depression, job loss, divorce (which led to being on welfare for a while), death, blizzards, recessions, strikes, & so much more. You’re not seeing the point, sadly. I find better deals at 2 of our supermarkets than Aldi’s with sales & coupons. The article specifically states that STORES RUN OUT OF SUPPLIES & PRICE GOUGE during emergencies. They show this on the news every single flipping time there’s an emergency. The reason because of people who assume they’ll be able to go to the store like any other day to buy supplies. That’s so far from the truth. That store or more quite possibly could be gone. Even if they manage to still be standing doesn’t mean they can get supplies (suppliers can’t get in or won’t go-there’s no electricity-there’s no working plumbing-etc.) I sincerely hope you never face an emergency where you have to worry about eating or keeping clean, but your way along with others will not keep you healthy.